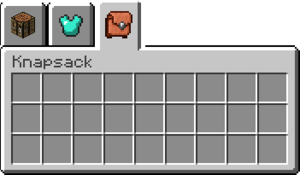 The Knapsack is an item added by Tinkers' Construct. It provides an additional 27 slots in its own inventory tab. Place the Knapsack in the Player inventory Armor Tab in the slot to the right of the Helmet. After switching to a new tab or closing and opening the inventory the Knapsack tab will be enabled to access its inventory. When the Player dies, all of the items in the knapsack drops to the ground like the rest of the items in inventory. Knapsack has no known uses in crafting. This page was last modified on 19 May 2016, at 18:23.